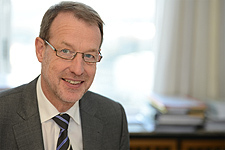 Richard Schröder graduated in Chemical Engineering at Technical University of Dortmund in 1979. In addition, he obtained a PhD degree in Chemical Engineering at Technical University of Dortmund in 1985. Richard is German patent attorney European patent attorney and European Trademark and Design Attorney. Richard has built up extensive experience in industrial patent practice. He mainly works in the area of membrane technology and of high performance fibres. In addition, he gained experience in the German Law of Employees' Inventions.